Yes, you can make pastry shop desserts in your own kitchen. 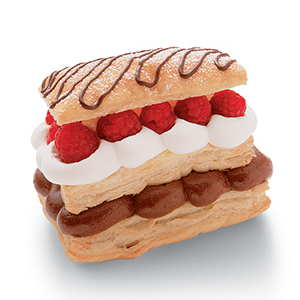 Prepared puff pastry makes it easy...just layer the pastry with whipped cream, chocolate cream and fresh raspberries, then drizzle with melted chocolate. Unfold the pastry sheet on a lightly floured surface. Cut the pastry sheet into 3 strips along the fold marks. Cut each strip into 4 rectangles. Place the pastries onto 2 baking sheets. Bake for 10 minutes or until the pastries are golden brown. Remove the pastries from the baking sheets and let cool on wire racks for 10 minutes. Split each pastry into 2 layers, making 24 in all. Beat the heavy cream, confectioners’ sugar and vanilla extract in a medium bowl with an electric mixer on high speed until soft peaks form. Reserve half the whipped cream. Fold half the chocolate into the remaining whipped cream. Divide the chocolate cream mixture among 8 bottom pastry layers and top with another pastry layer. Divide the reserved whipped cream among the pastries. Top with the raspberries and remaining pastry layers. Sprinkle with additional confectioners' sugar. Drizzle with the remaining chocolate. Easy Substitution: Substitute 2 cups thawed frozen whipped topping for the heavy cream. Omit the confectioners’ sugar and vanilla extract. Make-Ahead: This recipe can be prepared as directed above and refrigerated for up to 4 hours.